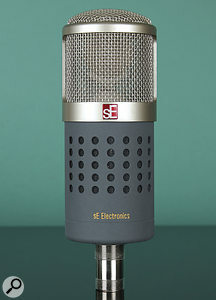 The original SE Gemini, whose name came about through its use of twin‑valve, transformerless circuitry, is now well accepted as a serious studio microphone. 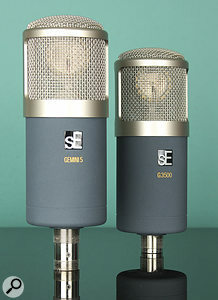 It has undergone a number of revisions over the years, and most recently its twin‑diaphragm, centre‑terminated capsule design has been incorporated into two new cardioid‑pattern models that run alongside the Gemini II in SE's range of mics, offering rather different features at a lower price point. Physically, the Gemini 5 looks like a smaller version of the Gemini II, but it is still a hefty microphone, featuring a cylindrical body machined from brass, with ventilation holes on the rear to help keep the circuitry cool. Finished in the now familiar SE grey rubbery paint, with the company logo picked out in red on the back and in black on the front, it has satin plating to the basket and trim, giving it a smart, professional look. 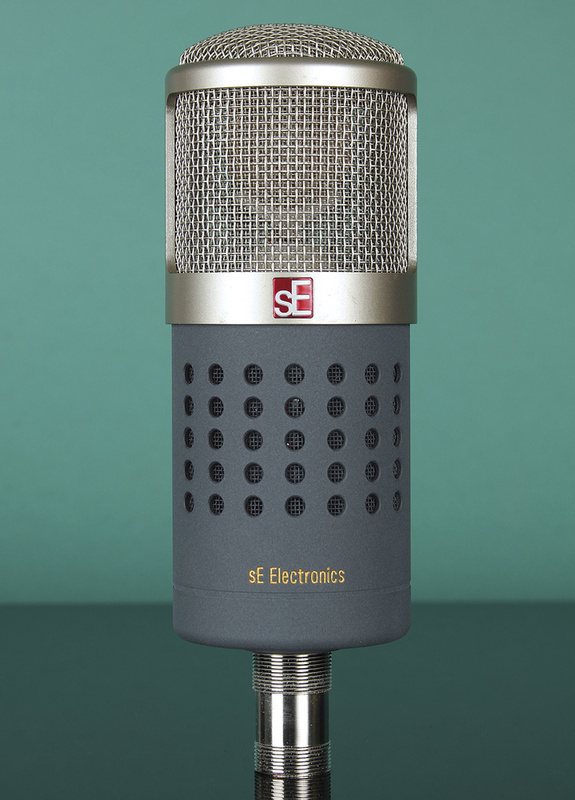 This mic may use the same capsule as the Gemini II, but the circuitry is rather unusual, in that it includes both traditional valve (based around a single dual-triode) and more modern FET preamps, to give a choice of tonal characters. Selection of the desired mode is done from the included power-supply unit, which connects to the mic via a substantial, locking, eight‑pin cable. Both FET and valve outputs are available via conventional three‑pin XLR connectors on the PSU panel, which means that you can use both at the same time if you want to. In either mode, the PSU provides power for the circuitry, so phantom power is not required. The Gemini 5's polar pattern is tight cardioid, and the frequency curve looks almost ruler flat from 50Hz to 5kHz, rising to a presence peak of around +5dB, centred at 10kHz. The frequency response is the same for both the FET and valve modes, in both cases extending to 30kHz, and the noise figures are typical for this style of microphone, which is designed mainly for close- to medium-range studio work, including vocals. There are no pad or low‑cut filter switches on the mic or the PSU, so any tweaking needs to be done on the preamplifier to which the mic is connected. A metal‑framed elastic shockmount and aluminium flight-case complete the package. Featuring exactly the same fixed cardioid‑pattern capsule, the G3500 has a frequency response curve that looks virtually identical to that of the Gemini 5. The key difference between the two is that the G3500 is equipped with a more conventional FET preamp, and has no valve option — which is presumably why they've dropped the Gemini name, despite its lineage. It broadly shares the same physical design and finish as the Gemini 5, other than having no ventilation holes — and being a FET mic, of course, it has no external PSU and requires a standard phantom-power source. Once again, there are no pad or roll‑off switches, which I feel is a bit remiss on mics at this price point, but on the up side, the G3500 comes in an aluminium case with SE's metal‑framed elasticated shockmount. Both new models screw into the base of the shockmount for secure fixing, so can be used upside down. Although SE recommend these mics for vocals and acoustic guitar, we also tested them using a number of other sources, to see how they'd fare — and given that the G3500 is 6dB quieter than the Gemini 5 in valve mode, we suspected it would be the better choice when recording quieter sound sources. The Gemini 5, which includes a dual-triode valve, has vents on the rear to allow for cooling. Predictably, perhaps, both these SE models sounded similar when the Gemini 5 was used in FET mode, but (presumably because of the impossibility of getting two mics in exactly the same place at the same time) our test recordings show up slight tonal differences. On vocals, the tube sound wasn't as different from the FET sound as you might imagine — although there was a definite hint of tube polish and smoothness to differentiate it, with a little more weight to the lower mid‑range. This is a good thing in my book, as mics with an obvious tube sound have probably been engineered to introduce unnecessary distortion. Staying with voice for the moment, the SE mics sounded brighter and perhaps a little more detailed than the AKG C12VR mic that I used as a reference, and that's possibly as a result of their presence-peak characteristics. That said, the C12VR is known for its syrupy top-end and lower-mid warmth, which is why it is useful for taming female vocals that are a touch strident. As the SEs are flat, other than having a fairly high presence-bump, they came across as detailed but relatively uncoloured, and responded well to EQ. On acoustic guitar, all three SE options worked nicely, as did the C12VR, although, again, the C12VR produces a warmer, more rounded sound, while the G3500 and Gemini 5 FET mode really bring out the pick detail. I liked the tube output on the Gemini 5 in this application, as it warmed up the sound in a subtle but useful way, without masking the pick attack. It was the same story with hand percussion: all the mics produced a workable sound, with the FET recordings being brightest, the tube output of the Gemini 5 somewhere in the middle and the C12VR being noticeably more rounded and full‑sounding. To make sure all three mics heard pretty much the same sound on electric guitar, I placed them together around 1.5 metres from the amp and first tried a couple of slow blues licks with mild distortion, which I thought sounded sweetest on the Gemini 5 tube output and the C12VR. Again, the C12VR gave the warmest sound, and in this context I rather liked it. Ultimately, all four options were eminently usable, so it all comes down to taste — though I feel that tube mics are generally kinder than FET mics to the high end of electric guitars. Finally, the clean electric-guitar test again sounded best to me via the two tube mics (the Gemini 5's tube output and the C12VR), but this time I thought the Gemini captured a more lively sound, that was closer to how I felt the amp actually sounded in the room. The FET mic options also worked perfectly well in this application, but they weren't quite so smooth at the high end, and may need some EQ to fine‑tune the sound. Both these mics deliver a solid and detailed sound, though in situations where the top end needs kinder handling, the Gemini 5, with its tube output option, is the better choice. They are primarily vocal mics, but they can deal with just about anything, and even though the G3500 and the Gemini 5's FET output can sound a little bright on some sources, they respond well to EQ, so it's easy to compensate for that. On well‑balanced material, the presence bump helps to keep sounds airy and up‑front, and it is well above the upper-mid range, where boosting can lead to stridency. There are other FET and tube mics at this price that deliver extremely good results, but these SE models are well made, they sound good, and they can turn their hands to most studio recording tasks. They're definitely worth checking out, especially if you lusted after the original Gemini. In this price range, the MXL Genesis is an obvious contender, as are the lower-cost Neumann TLM models. However, I don't know of any comparable mic that offers both valve and FET outputs like the Gemini 5. 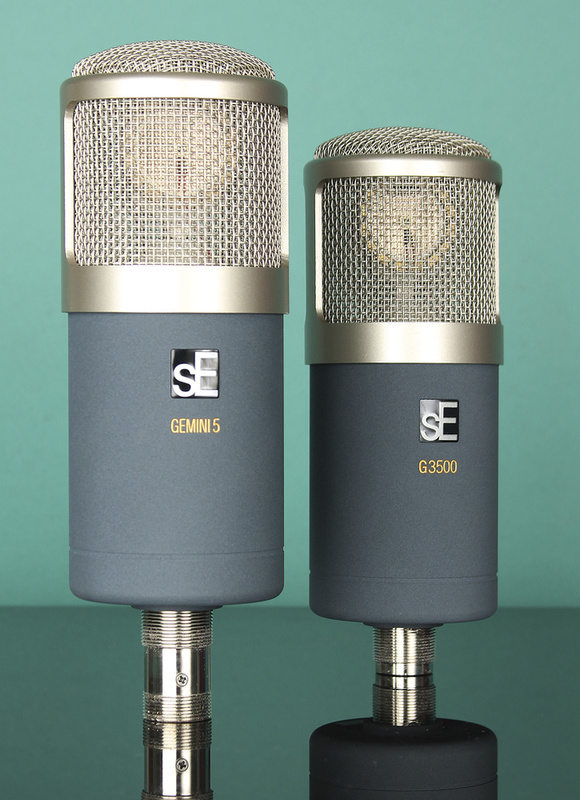 Both mics are versatile performers, more so the Gemini 5 with its choice of valve or FET outputs. Based on the proven Gemini capsule. Shockmounts and aluminium cases included. No pad or roll‑off switches. These mid‑price mics make a welcome addition to the SE range, and the dual-output option of the Gemini 5 really adds to its flexibility. Gemini 5 £997.58; G3500 £715.58. Prices include VAT. Sonic Distribution +44 (0)845 500 5200. Gemini 5 $1299; Gemini 3500 $999.